The Electorate of Trier (German: Kurfürstentum Trier or Kurtrier), traditionally known in English by its French name of Trèves, was an ecclesiastical principality of the Holy Roman Empire that existed from the end of the 9th to the early 19th century. It consisted of the temporal possessions of the prince-archbishop of Trier (Erzbistum Trier), also prince-elector of the empire. There were only two other ecclesiastical prince-electors in the Empire: the Electorate of Cologne and the Electorate of Mainz, among which Mainz ranked first. The capital of the electorate was Trier, with the main residence of the Elector being Koblenz from the 16th century onward. The electorate was secularized in 1803 during Napoleonic rule. The Elector of Trier, in his capacity as archbishop, also administered the archdiocese of Trier, whose territory did not correspond to the electorate (see map below). 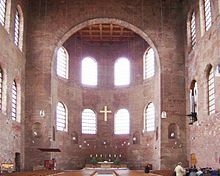 Trier, as the important Roman provincial capital of Augusta Treverorum, had been the seat of a bishop since Roman times. It was raised to archiepiscopal status during the reign of Charlemagne, whose will mentions the bishoprics of Metz, Toul and Verdun as its suffragans. The bishops of Trier were already virtually independent territorial magnates during the Merovingian dynasty. In 772 Charlemagne granted Bishop Wiomad complete immunity from the jurisdiction of the ruling count for all the churches and monasteries, as well as villages and castles that belonged to the Church of St. Peter at Trier. In 816 Louis the Pious confirmed to Archbishop Hetto the privileges of protection and immunity granted by his father. At the partition of the Carolingian empire at Verdun in 843, Trier was given to Lothair; at the partition of Lotharingia at Mersen in 870, it became part of the East Frankish kingdom, which developed into the Kingdom of Germany. In 898 Archbishop Radbod received complete immunity from all taxes for the entire episcopal territory, granted by Zwentibold, who was the natural son of Emperor Arnulf of Carinthia, and who reigned briefly as King of Lotharingia. He was under great pressure from his independent nobles and desperately needed a powerful ally. The gift cemented the position of the archbishops as territorial lords in their own right. Following Zwentibold's assassination in 900, the handlers of the child-king Louis courted Radbod in their turn, granting him the district and city of Trier outright, permission to impose customs duties and the right to a mint (as much a symbol of independent authority as an economic tool). From the court of Charles the Simple, he obtained the final right of election of the Bishop of Trier by the chapter, free of Imperial interference. In early modern times, the Electorate of Trier still encompassed territory along the Moselle River between Trier, near the French border, and Koblenz on the Rhine. From the early 13th century the Archbishop of Trier, as holder of an imperial office was traditionally an Imperial Elector of the German king. The purely honorary office of Arch-chancellor of Gaul arose in the 13th century. In this context that was taken to mean the Kingdom of Arles, or Burgundy, technically from 1242 and permanently from 1263, and nominally until 1803. Arles along with Germany and the medieval Kingdom of Italy was one of the three component kingdoms of the Holy Roman Empire. In 1473, Emperor Frederick III and Charles the Bold, Duke of Burgundy held a meeting in Trier. In this same year, the University of Trier was founded in the city. With the Thirty Years' War (1618–48), more than two centuries of warfare began for Trier. It was occupied several times by French troops. They besieged and occupied Trier in 1632, 1645, 1673 (the French Army stayed until 1675 and destroyed all churches, abbeys and settlements in front of the city walls; the city itself was heavily fortified). In 1684, with the War of the Reunions, an era of French expansion began. Trier was again captured in 1684; all walls and fortresses were destroyed this time. After Trier and its associated electorate were yet again taken during the War of Palatinate Succession in 1688, many cities in the electorate were systematically destroyed in 1689 by the French Army. Nearly all castles were blown up and the only bridge across the Moselle in Trier was burnt. King Louis XIV of France personally issued the order for these acts of destruction. As the French Army retreated in 1698, it left a starving city without walls and only 2,500 inhabitants. During the War of the Spanish Succession in 1702, Trier was occupied again by a French army. In 1704–05 an allied Anglo-Dutch army commanded by the Duke of Marlborough passed Trier on its way to France. When the campaign failed, the French came back to Trier in 1705 and stayed until 1714. After a short period of peace, the War of the Polish Succession started in 1734; the following year Trier was again occupied by the French, who stayed until 1737. The last Prince-Elector, Clement Wenceslaus of Saxony, relocated to Koblenz in 1786. In August 1794, French Republican troops took Trier. This date marked the end of the era of the old electorate. Churches, abbeys and clerical possessions were sold or the buildings put to secular use, such as stables. The last elector, Clemens Wenceslaus, resided exclusively in Koblenz after 1786. From 1795, the territories of the Electorate on the left bank of the Rhine were under French occupation; in 1801, they were annexed and a separate French-controlled diocese established under Bishop Charles Mannay. In 1803, the French diocese assumed control of the whole diocese and what was left of the electoral territory on the eastern bank of the Rhine was secularized and annexed by Nassau-Weilburg in 1803. For a complete list of archbishops, see Roman Catholic Diocese of Trier. ^ From 1794, after the French conquest of the Imperial territories on the left-bank of the Rhine, Clemens Wenceslaus of Saxony was archbishop with effect on the right bank only.